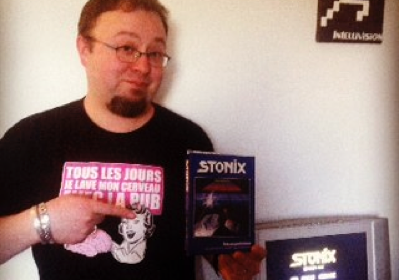 Arnauld Chevallier, creator of Stonix, is one of the important players in the Intellivision community. Although he maintains a low profile, the 37 year old Parisian has been programming for the Intellivision since the early part of the millennium. There continues to be no end to the projects he is working on for this classic Mattel console. What motivates him to program for a 30 year old console? La version française est à lire sous la version anglaise. Back in the day, what games did you play? Back then, we had very few games, and after the video game crash, we didn’t have any more access to new titles. The last one I bought was Burgertime. There were still quite a few available in the US, but in France, there was nothing available. How did you fall into the cauldron that is Intellivision? As a child, as did most of the people who are still interested in Intellivision today. I was between 7 and 8 years old. My parents bought an Atari 2600, and we resold that pretty quickly in order to move on to the Intellivision. Early on, I really didn’t understand how it all worked, but I was always passionate about it. What is it that you were passionate about, video games in general, or the Intellivision in particular? Video games in general. I always wanted to understand how they worked, how they were made. Any idea how many games you had? Probably about a dozen. After that I pretty much moved on to computers. I had a Thomson because I caught the computer bug while I was at school, in college. After that I moved on to Atari , and then PCs. On the subject of the Intellivision, what was your favorite game? It was always Burgertime. Because of this, I wanted to get into contact with the creator of Burgertime, Ray Kaestner. So I sent him an email, and subsequently, I was able to meet him in person at a convention in San Jose in 2004. Why did you wish to meet him? Simply because Burgertime was my favorite game. On one hand, I simply wanted to meet him, but on the other hand, I had also reverse engineered the game. Meaning, I had taken the ROM image, and I tried to recreate the source code so that I could modify the tables. Since then, David Harley has used my program, created from this effort to create new levels. These can be found on the Internet. As a result, I had a lot of fun discussing this program with Kaestner 30 years later. Seeing as it’s your favorite game, any idea what you best score is? I don’t remember. It’s gotta be about 300,000. We can’t really label you as a collector, can we? No. My original games are still at my parents home.Here, I have a few games, but they are mainly Homebrews. King of the Mountain, two copies of Stonix. SameGame and Robots and two copies of Space Patrol. One copy of Minehunter and an empty box. 4Tris in the cardboard box, one of the first editions. I also have a CC3 which lets me play all the games. I used to have an Intellicart. The CC3 is more practical, no longer need to turn off the console to switch games, just press reset. I’d like to discuss programming with you if you don’t mind. You are know as one of the most knowledgeable programmers for the Intellivision. What pushed you to start programming for Intellivision? As the years went by, I had completely forgotten about the Intellivison. During my Military service, between 1998-1999, I was a scientist for the army. We weren’t exactly overloaded with work. As a result, I had time to browse the Internet. I happened to run across the emulator done by Carl Mueller. 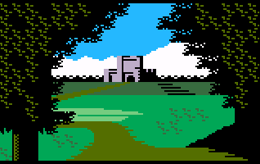 Then, I stumbled onto what Joe Zbiciak was working on, and I began to realize that there was this Intellivision community out there that I never suspected. That began to interest me, because I had always wanted to make games for the system. So my first task was to figure out how an Intellivision game was programmed. To help me figure that out, I relied on the documentation complied by William Moeller. Subsequently, I discovered INTV Prog which is a Yahoo user group which remains very active today. At any rate, at that time, it was very active. How does your Intellivision Adventure begin? It started like this: I knew that there were games that were going to be released, and I had to get involved. The first thing I did was create an RPN calculator, which allowed me to test the behaviour of the processor, and to understand how the system worked. On that subject, the Intellivision processor is very advanced for its time. Even back then, it was a 16 bit environment which was not the norm for that period. It was very rudimentary, but it still paced it ahead of many of the other processors of that era. This work allowed me to familiarize myself with the tools at my disposal. Next, I started work on Castle. This project started before Stonix? The game is not finished. To do so, I ‘d have to start over from scratch. It was my first project, I’d approach it much different today. Will Castle be released one day? I’d love that. I’d have to work on it. In addition, the way Golden Eagle works would have to be revisited. There are only 3 exits, three entrances. This would limit the interest in the game? It’s a little constraining. I wonder if I shouldn’t add a 4th? Next you began work on Stonix. How did that adventure start? David Harley was in Germany, and had seen my demo of Stonix. He got in contact with me and encouraged me to develop the game. There are 106 levels, of which 6 are hidden, is that correct? There should be a few more, there are some that we didn’t keep. David and I worked on the game by mail. We exchanged a lot of mail. We each did tests on our end. The game itself isn’t that complicated, but afterward, there’s a lot of fine tuning. The priority was the play-ability of the game. It had to be interesting. Have you ever made it to the 100th level in Stonix? Not without cheating! But I did finish the 100th level without cheating! The only person I know to make it past level 100 is Cyril Denis, the author of Revival. Stonix has been sold out for some time now. You must also be aware that Elektronite would like to re-release Stonix. What do you think about this? David and I have an agreement, and without Davids OK, it’s not going to happen. Besides Stonix, what other games have you worked on? I worked with Joe on the music for Space Patrol (LTO) and a few other games. I also worked on a lesser extent on the most recent game release, Christmas Carol, which uses my routines for the music. It’s really fun what they’ve done. The box really reminds you of the boxes from the era. It’s some really nice work. Did you know that there is a Championship underway on Atari Age for this game? Yes, until the end of the month. I’m not sure how it will be controlled, since it can be played on an emulator. It should be easy enough to cheat…just mess a bit with the rom. I imagine this will be controlled. Defender of the Crown is a highly anticipated game. Certainly the most anticipated game at the moment. You have asked Valter to find a solution to finish the game with a kickstarter to help find a programmer to finish the game. What do you think about this? If I don’t seem too eager to finish the game, it’s because I’ve done nothing but ports/conversions and I really want to release an original game. You are currently working on a previously unseen game, which doesn’t yet have a title, but for which the main game engine is already really advanced, is that correct? Yes, the game does not yet have a name, or a story. The game engine is inspired by Dungeon Master on the Atari ST. On second thought, the ambiance is closer to a game like Doom 3. You want to make the most terrifying and heart pounding game the Intellivision has ever seen. How will you make that happen? Will it really be more unnerving than ADD. It’s based on that type of ambiance. But it will be even more scary. An important point about this game. It will rely a lot on the Intellivoice. Joe has developed a program that allows you to put almost anything through the Intellivoice. How far along is the game at this point? Hard to say. The game engine is very far along. But it’s not moving along very quickly. I need an inspiration to push me to move forward in programming the game. What is the project that you are working on that you have not yet revealed? I’m working on an editor for the Intellivision Music Synthesizer. There’s already a game for the Synthesizer but nothing for those that really want to play music. Regarding it’s release, I have no predictions at the moment. There is a module which will soon be released for the Colecovision which will improve the capacity of the console. There were suggestions of doing something similar on the Intellivision. What do you think of this? I’m against the idea. There’s no point. Technically, we can do whatever we want to do. Already, the boards produced by Joe allow more Ram, so that’s already a positive. There are also accelerator functions. For example, the processor in the Intellivision is not capable of doing multiplications and division natively; the new cartridges make it possible. The most recent version of Space Patrol allows you to save your high scores. If we never take it any further, it’s already good enough. We shouldn’t go much beyond this, to do so would corrupt (pervert the purity) of the console. What would you like to say to the fans of the Intellivision? Regarding the future of the console? There are still lots of projects in the works, and as long as there are fans, there will always be more games, and not just games! Créateur de Stonix, Arnauld Chevallier est un des acteurs importants de la communauté Intellivision. Jeune homme discret de 37 ans vivant à Paris, il programme sur l’Intellivision depuis le début des années 2000. Et pour la console de Mattel, il n’en finit pas d’avoir des projets. Retour sur ce qui le pousse à programmer sur une console vieille de plus de 30 ans. Comment es-tu tombé dans le chaudron de l’Intellivision ? Tout jeune, comme la plupart des personnes qui s’intéresse à l’Intellivision aujourd’hui. J’avais entre 7 et 8 ans. Mes parents avaient acheté une VCS 2600 et on l’a revendu assez vite pour passer à l’Intellivision. Au début, je ne comprenais vraiment rien à la manière dont cela fonctionnait mais cela m’a toujours passionné. Qu’est-ce qui te passionnait, les jeux vidéo ou la console Intellivision ? Les jeux vidéo. J’ai toujours voulu comprendre comment cela fonctionnait, comment les jeux étaient conçus. A l’époque, à quels jeux jouais-tu ? On avait très peu de jeux à l’époque et avec le crash du jeu vidéo, on n’avait plus accès aux nouveaux jeux. Le dernier que j’ai eu était Burgertime. Il y en a pas mal qui sont sortis aux US mais en France on ne trouvait plus rien. As-tu une idée du nombre de jeux que tu avais ? Cela devait être une douzaine. Après je suis passé plutôt sur ordinateur. J’ai eu un Thomson parce que j’ai connu la vague de l’informatique à l’école, au collège. Après je suis passé sur Atari et enfin sur PC. Pour revenir à l’Intellivision, quel était ton jeu préféré ? Cela a toujours été Burgertime. J’ai d’ailleurs voulu entrer en contact avec le créateur de Burgertime, Ray Kaestner. Je pris contact avec lui par email puis ensuite, je l’ai rencontré en personne au salon de San Jose (USA) en 2004. Pour quelle raison souhaitais-tu le rencontrer ? Justement, parce que Burgertime était mon jeu préféré. D’une part je voulais le rencontrer et d’autre part, j’avais fait du reverse ingénierie sur le jeu. C’est-à-dire que j’étais parti de la Rom et j’ai essayé de reconstruire le code source pour pouvoir modifier les tableaux. D’ailleurs, David Harley a utilisé mon programme tiré de cela pour faire de nouveaux niveaux. On les trouve sur Internet. Donc, cela m’amusait de commenter avec Kaestner le programme 30 ans après. Puisque c’est ton jeu préféré, as-tu une idée de ton meilleur score ? Je ne sais plus. Cela doit être dans les 300 000. On ne peut pas dire que tu sois collectionneur ? Non. Les jeux de l’époque sont chez mes parents. Ici, j’ai quelques jeux mais ce sont surtout des homebrews : King of Mountain, Stonix en deux exemplaires, SameGame and Robots, Space Patrol en 2 exemplaires aussi, un exemplaire de MineHunter et une boite vide, 4-Tris, dans sa boite en carton, une des premières éditions. J’ai aussi une CC3 qui me permet de jouer à tous les jeux. J’avais une intellicart avant. La CC3 est plus fonctionnelle, plus besoin d’éteindre la console, il suffit juste de faire un « reset » pour changer de jeu. Parlons programmation si tu veux bien. Tu es connu comme l’un des acteurs les plus actifs en la matière sur Intellivision, qu’est ce qui t’a poussé à commencer à développer sur Intellivision ? Avec les années, l’Intellivision, je l’avais oublié. Durant mon service militaire, entre 1998 et 1999, j’étais scientifique du contingent. On était pas vraiment surchargés de travail, Je donc j’avais du temps pour traîner sur Internet. Je suis tombé à l’époque sur l’émulateur de Carl Mueller. Ensuite, je suis tombé sur ce que faisais Joe Zbiciak et je me suis rendu compte qu’il y avait une communauté Intellivision que je ne soupçonnait pas. Cela m’a intéressé car j’avais toujours voulu faire des jeux dessus. Alors, mon premier travail a été de comprendre comment était programmé un jeu Intellivision. Pour cela, je me suis basé sur la documentation compilée par William Moeller. Ensuite, je découvre aussi INTV Prog qui est un groupe sur Yahoo! qui reste un des groupes les plus actifs. En tout cas, à l’époque, il était très actif. Comment démarre l’aventure Intellivision ? Ce projet a démarré avant Stonix ? La Rom est disponible ? Le jeu n’est pas terminé. Pour cela, il faudrait repartir de zéro car comme c’était mon premier projet, je ferais autrement aujourd’hui. Castle sortira t-il un jour ? J’aimerais bien. Il faudrait travailler le scénario. Et puis, le mode de fonctionnement de l’Aigle d’Or est à revoir. Il n’y a que 3 sorties, 3 portes d’accès. Cela limite l’intérêt du jeu ? C’est un peu contraignant. Je me demande si je n’ajouterais pas une 4e issue. Par la suite, tu as travaillé sur Stonix, comment a démarré l’aventure ? David Harley était en Allemagne et avait vu ma démo de Stonix. Il a pris contact avec moi et m’a proposé de développer le jeu. J’étais partant ! Du coup, j’en ai profité pour améliorer l’éditeur de tableaux que j’avais programmé. Cela a pris quasiment un an pour développer Stonix. Il y a 106 niveaux dont 6 niveaux cachés, c’est bien cela ? Il doit y en avoir un peu plus, il y en a que nous n’avons pas gardé. Avec David, pour développer le jeu, nous avons travaillé par mail. On s’est échangé beaucoup de mails. On a réalisé des tests chacun de son côté. Bon, le jeu en lui-même n’est pas très compliqué mais après, y a tous les réglages à faire. Ce qui importait, c’était la jouabilité du jeu. Il fallait que cela soit intéressant. As-tu déjà atteint le 100e niveau de Stonix ? Pas sans avoir triché ! Mais j’ai fini le 100e niveau sans avoir triché. Le seul que je connais à avoir fini le 100e niveau est Cyril Denis, l’auteur de Revival. Il l’a fini sans les cheat codes qui doivent être disponibles sur Internet. Ils permettent d’avoir des vies infinies ou de passer d’un niveau à un autre. Stonix est épuisé depuis un bon moment déjà. Et tu dois savoir qu’Elektronite souhaite rééditer Stonix, qu’en penses-tu ? Avec David, nous avons un accord et sans son accord, cela ne se fera pas. A part Stonix, sur quels jeux as-tu travaillé ? J’ai travaillé avec Joe sur la musique de Space Patrol (LTO) et quelques autres jeux. J’ai aussi participé à un moindre niveau au dernier jeu sorti, Christmas Carol, qui utilise mes routines pour la musique. C’est plutôt sympa ce qu’ils ont fait. La boite rappelle vraiment les boites de l’époque. C’est du beau boulot. Sais-tu qu’il existe un championnat sur Atari Age sur ce jeu ? Oui, jusqu’à la fin du mois. Je ne sais comment cela va être contrôlé car on peut jouer sur l’émulateur. Il devrait être assez facile de tricher… si on bricole un peu la Rom. J’imagine que cela sera contrôlé. Defender of the Crown est un jeu très attendu, certainement le plus attendu actuellement. Tu as demandé à Valter de trouver une solution pour le terminer. Il a été évoqué une souscription (un kickstater) pour trouver un programmeur qui pourrait le terminer, qu’en penses-tu ? Si je n’ai pas l’envie de terminer le jeu c’est que je n’ai fait que des conversions et j’aimerais bien réaliser un jeu original. Tu travailles actuellement sur un jeu inédit qui n’a pas encore de titre mais dont le moteur principal est déjà bien avancé, c’est bien cela ? Oui, le jeu n’a pas de nom, pas encore d’histoire. Le moteur du jeu s’inspire de Dungeon Master sur Atari ST. En revanche, l’ambiance est plus proche d’un jeu comme Doom 3. Tu veux en faire le jeu Intellivision le plus oppressant et effrayant jamais conçu ? Comment vas tu y arriver ? Cela t-il vraiment plus oppressant que ADD ? Cela se base sur cette ambiance là. Ce sera plus effrayant encore. Un point important concernant ce jeu, c’est qu’il s’appuiera beaucoup sur l’Intellivoice. Joe a sorti un programme qui permet d’injecter un peu près n’importe quoi dans l’Intellivoice. Où en est le jeu actuellement ? C’est difficile à dire. Le moteur du jeu est très avancé. Mais cela n’avance pas très vite. J’ai besoin d’un scénario pour me pousser à avancer dans la programmation du jeu. Quel est le projet sur lequel tu travailles et que tu n’as pas encore dévoilé ? Je travaille sur un éditeur pour le clavier musical de l’Intellivision. Il y a actuellement un jeu pour le clavier musical mais rien pour ceux qui veulent vraiment jouer de la musique. Quant à sa sortie, je n’ai rien prévu pour l’instant. Sur Colecovision sort prochainement un module qui permet d’améliorer les capacités de la console. Il a été question de travailler sur un tel dispositif sur Intellivision, qu’en penses-tu ? Je suis opposé à cette idée. Cela n’a aucun intérêt. Techniquement, on peut faire ce qu’on veut. Déjà, les nouvelles cartouches produites par Joe ont plus de RAM, donc, ça, c’est déjà bien. Il y a aussi des fonctions d’accélération. Par exemple, le processeur de l’Intellivision n’est pas capable de faire des multiplications et des divisions en natif, les nouvelles cartouches le font. On doit pouvoir aussi sauvegarder les scores avec la dernière version de Space Patrol. Si cela en reste là, c’est très bien. Il ne faut pas aller au-delà car sinon on dénature la console. Qu’aimerais-tu dire à tous les fans d’Intellivision ? Sur le futur de la console ? Il y a encore beaucoup de projets et tant qu’il y aura des fans, il y aura encore des jeux et pas seulement des jeux ! Interview par Scalpel, 2 décembre 2012.